Gluten is a large protein found in wheat and certain other grains – barely, spelt and rye. Many people can have difficulties digesting gluten, and for an estimated 1 out of 100 people, gluten can trigger an immune system response that may lead to impaired nutrient absorption and wide range of other symptoms throughout the body. 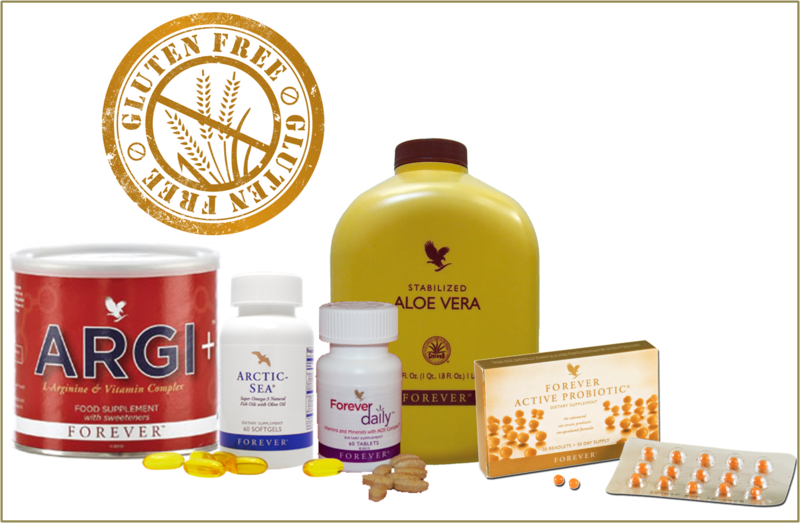 With the increasing awareness of gluten and the desire of many to follow a gluten-free diet, the vast majority of products Forever Living offers are gluten-free. This means they test at levels far less than 20 part per million (ppm) of gluten – the level set by the US Food and Drug Administration for gluten-free claims. For those trying to avoid or limit gluten in their diets, several Forever Living products can help to provide needed nutrients, and support digestion and energy levels. Products such as Forever Daily™ can help to provide a full complement of vitamins and minerals. Additionally, products like Forever Aloe Vera Gel™ can help support digestion and absorption of nutrients and Forever Active Probiotic® can help to promote adequate nutrient utilization. Essential fatty acids also play a role in supporting immune function and cellular health. Forever Arctic Sea® provides a balanced blend of the essential Omega-3 fatty acids – DHA and EPA. ARGI+® provides 5 grams of L-arginine per serving, which supports nitric oxide production in the body and helps to support circulation, to foster nutrient delivery to cells and tissues throughout the body. In addition, because some people may experience skin irritation from personal care and cosmetic products that contain gluten, flawless by Sonya™ and Forever Living’s Personal Care products have been formulated, whenever possible, without gluten-containing ingredients, and the majority of these products are gluten-free as well. In keeping with our commitment to providing the highest-quality ingredients and products, Forever Living’s products are routinely tested for gluten, to ensure that those following a gluten-free lifestyle can be comfortable in their product choices and support their overall health and well-being.